Shopping | Love Those "Hands at Home"
What does your region have in abundance? I love where I live, in upstate New York, because of the abundance of water, open and free places, splendid scenic wonders, reminders of America’s history, feelings of nostalgia for my own family roots. On the other hand, there’s an absolute dearth of shopping opportunities. We have the dollar stores, drug stores chains, and Walmart. We don’t have a decent bookstore or any place to buy clothes beyond J.C. Penney, really, which explains why my wardrobe mostly arrives in the mail, from L.L. Bean. One small aspect of our local shopping scene, however, makes me ridiculously happy—we have an abundance of apple orchards. I can think, off the top of my head, of 7 or 8 big orchards within a 25-mile radius. We have an orchard for every occasion! We have an orchard for apple cider donuts. These donuts are very important to my happiness, with their crunchy, spicy, fall-tasting cinnamon and sugar coating. The same orchard is also where we go, in general, for baked goods (crumb-topped apple pie!) and for taking photos of small children in a big pumpkin patch. But we don’t buy apples there. We have an orchard for hard cider. They have a number of different ciders, from sweet to dry, and they have a tasting room. You gotta love a tasting room! We like their cider with Thanksgiving dinner, but we don’t buy apples there. We have an orchard for nostalgia. One of the local orchards was started and run by my family for years. It’s no longer in our family but they keep a photo of my grand-aunt and uncle on the wall, and honor those roots. We go there to soak up the good feelings and buy Christmas wreaths. But we don’t buy apples there. 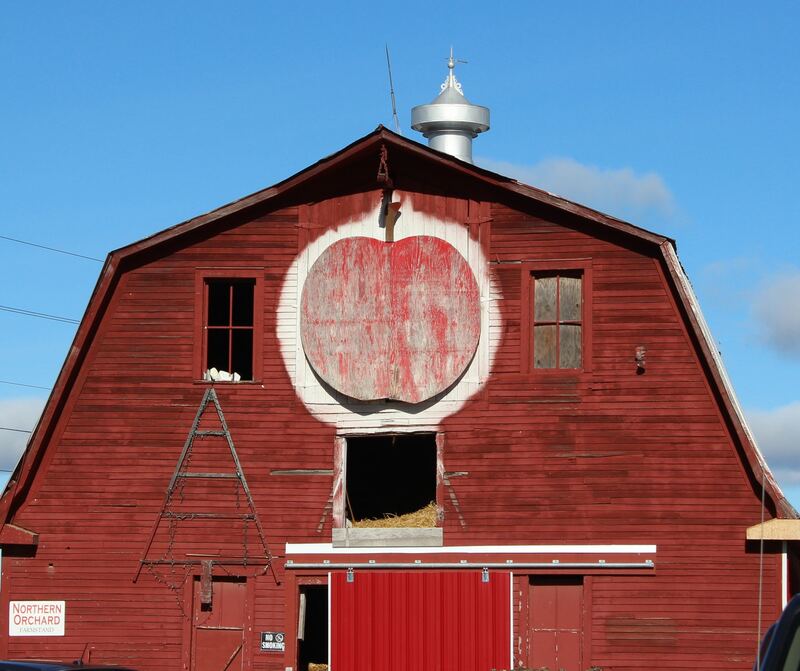 We have orchards known for “pick you own” apples and for corn mazes or hayrides. We have big-time commercial orchards—you may be eating apples from our North Country orchards! We have orchards that are also garden centers in the spring and summer. We have orchards that sell lunch. We have orchards that sell Christmas trees and wreaths and homemade jams and gluten-free baked goods. And chocolates and veggies and maple syrup. And, of course, they all sell apples but we only have one orchard for apples. One local orchard offers newly-minted, exciting, experimental apples that have not yet been given a name. Every year we try apples known only by their numbers and we wait to see which ones make the cut to be honored with a name. We knew the yummy Autumn Crisp when it was only known as NY674. This orchard has the old apples, the most-favorites apples, the apples you might see in the supermarket, and apples I never see anywhere but this one stand. Every trip there is an adventure because something new has just ripened and been brought in off the tree. Sometimes, they will walk out to the trees and pick the apples we want, while we wait ! Last week we got Pinovas and Irons and SnapDragons and RubyFrosts and Spartans and Silkens. In weeks to come, we’ll look forward to Autumn Crisp and, especially, the supercalifragi-apple, the Northern Spy. Did I say we have a dearth of shopping opportunities here?! What was I thinking?! The rest of the world can keep their high-end malls and their Fifth Avenues; I can get pretty much everything I really want or need at a local orchard. Can you get what you really want in your immediate locale? Buying New or Making Do? It’s time to start a new project! How will you approach it? Will you buy new or make do? Will you shop for the love of shopping and stockpile fabrics, yarns, beads, foodstuffs on speculation? Will you choose a project, and then go looking in the stores for the perfect materials? Will you look at what you have on hand and plan a project from there? And, if you choose the latter, will you feel you’ve settled for less? As a maker, I’m faced with these kinds of decisions all the time and, honestly, my first instinct is to go to the fabric shop or the craft supplies website and shop. I’m trying to consciously re-evaluate that impulse. When I wrote a post recently about why do we do the things we do, I got thinking about all this and about what motivates me to make. Two of the things I mentioned were that I liked to solve problems and I liked the idea of connecting with people who came before me. What I didn’t say, but a commenter did and I realized it applies to me, too, is that making things is a way to step outside my reliance on “store bought” and to make do with what I have and what I can make. Our consumer culture has taught us to buy, not just finished products, but also lots of pretty materials with which to make things. 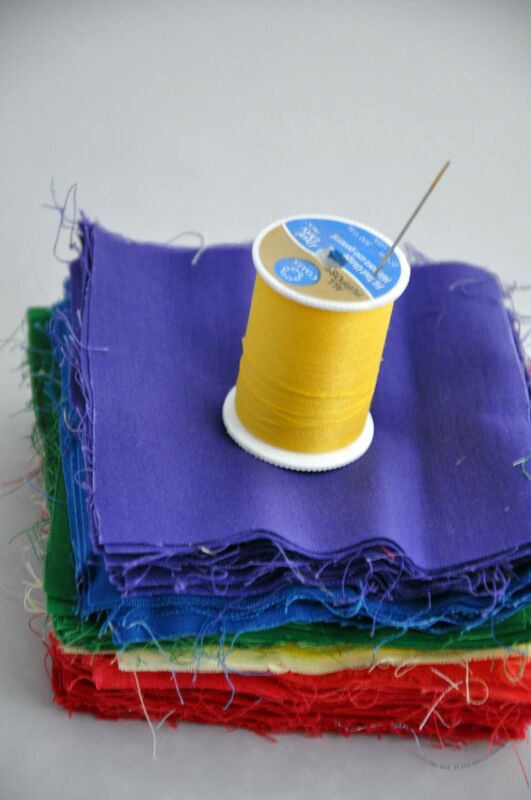 We buy fabrics and craft supplies the same way we buy electronics and clothes and home décor items. We choose new and plentiful over that which we already own. Sometimes we don’t bother to choose at all; we buy it all. But, you see, I’ve always been disdainful of this consumer culture. Or at least I talk that talk. When you get me talking, I’ll say that one of the things I admire most about vintage handmade items is the evidence of “making do” that resides in the pieces. I love old quilts that are imperfect because the maker used scraps or obviously ran out of fabric and substituted another one instead of buying more. I love reading an old recipe, with notes in the margins about substituting ingredients. I love the idea of dividing and otherwise propagating new plants from the ones I already have, to fill in the bare patches is the gardens. Making do leaves its own marks of loving hands—I look for those marks and they make me smile. My love of these things reminds me that, when I myself am gathering materials for a project, I should look around at what I have to work with. I should more consciously walk the walk of making do. I wanted to make do with my last weaving project. I wanted to make dishtowels and I wanted to use material I had on hand, from the stash of yarn we got when we bought the secondhand loom. If I had bought new yarn, the packaging would’ve told me how many threads to use per inch, based on the weight of the fiber. But I used what I had, made a guess about how many threads, and ended up with pretty striped fabric that more closely resembles mosquito netting than dishtowel. I felt like I had settled for less. Disappointed, I immediately decided I would buy new, “right” yarn, and re-do the project. But wait! Maybe I should use what I still have on hand and figure out how to make do and make better! To do so would give me the chance to a) solve problems, b) connect with people who came before me and who had to make do, and c) step out of the cycle of buying more. Hey! Those are the things I claimed motivate me to do the things I do! Walk the walk, girlfriend, walk the walk. I could learn a lot from my foremothers, whose choices were constrained by practical considerations. They often made their choices from what they had on hand and re-used scraps of old fabric or used ingredients available on the farm to decide what recipe to make. They used highly developed problem-solving skills to substitute and piece together and adapt materials and still create beauty. They still had choices aplenty but different kinds of choice. They made do, out of both necessity and temperament. But I’m no purist on this subject. In an age where we have so much available to us, the choice between making do and buying new doesn’t have to be absolute. Sometimes, buying new makes total sense. If, as makers, we are motivated to make purely for expressive and creative reasons, then buying the exact right materials is probably necessary. When I made the “Cot to Coffin” quilt recently for a War of 1812 bicentennial, the constraints were so specific that it made sense to buy new. In so many cases, though, for those of us who look to build on a tradition and to get in touch with history and rely less on store bought, why not re-evaluate our impulse to go shopping? So, for my next quilting project? How about if, instead of starting a new top with new materials, I finish one of the dozen vintage quilt tops I have in the cupboard? Or use up some of the myriad of leftovers pieces of fabric from the quilt I finished last year? How about I weave with what we have on hand, and just think harder during the planning stage? What if I “shopped” my pantry before deciding what to bake? I’m saying all of this out loud not to judge or promise or set anything into stone. I’m only seeking to remind myself, imprint in my own thoughts, the value I see in making do so, when I’m tempted to buy a lot of stuff, I might think twice. Because making do might mean settling for more. I like my Christmas to smell. Yes, I want to see bright lights and colors, as well as snow on the ground. I want the taste of peppermint and the feel of flannel PJs but mostly I love the smells I associate with the winter holidays. You probably know the smells I mean. Evergreen boughs. Cookies baking. A wood fire. Caramel and chocolate and mint. And the best smell of all, to my way of thinking—oranges studded with cloves. Every year at this time, my husband gets a big bag of oranges and a big jar of whole cloves and makes pomanders while he watches football on TV. He has done this for many years and, because the cloves dry and preserve the oranges, we probably have pomanders around here that are older than some of you! 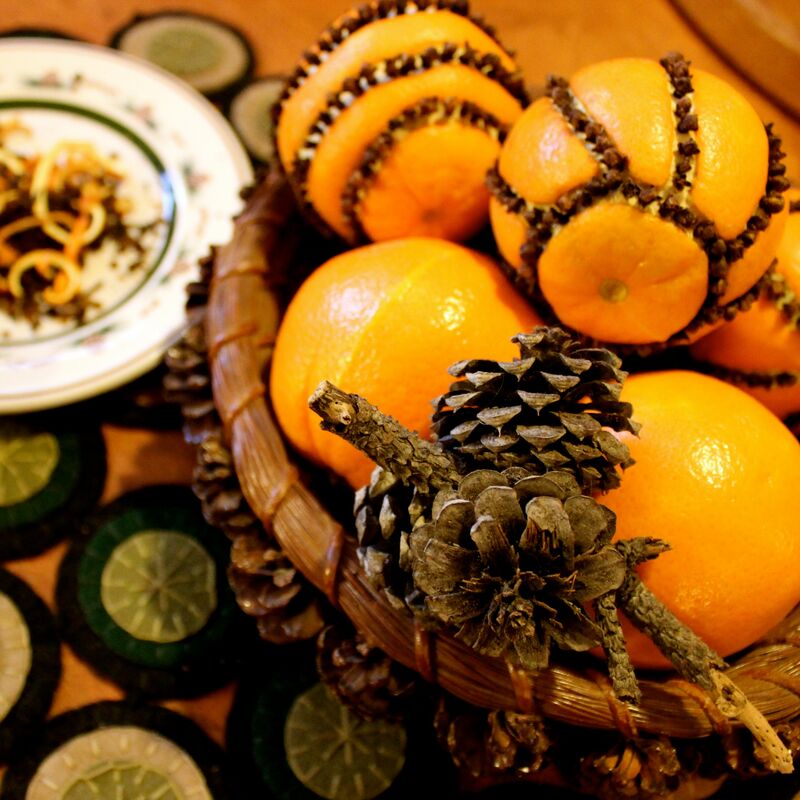 Pomanders make a wonderful addition to holiday decorating. They are natural and rustic and nostalgic but can also look quite modern, with the geometric design and bright contrast of colors. But, really, we make them mostly for that heavenly, spicy, zippy smell of bright citrus mixed with exotic clove. Oranges—get small to medium ones. They don’t have to be perfect and expensive. Save your money for the zester (see below). 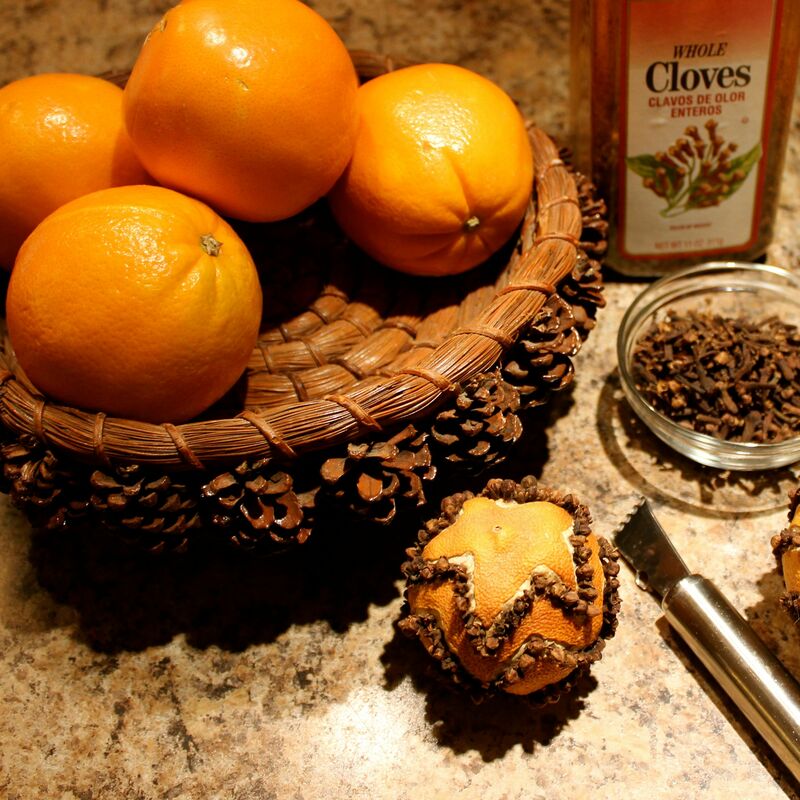 Whole cloves—don’t buy these in the little tins in the baking aisle, unless you only want to make one or two pomanders—they’re expensive that way! Try a restaurant supply store or a place like Sam’s Club, or order online, where you can find a whole pound for about $15-20. That big jar in the photos holds 11 ounces and has lasted a long time. 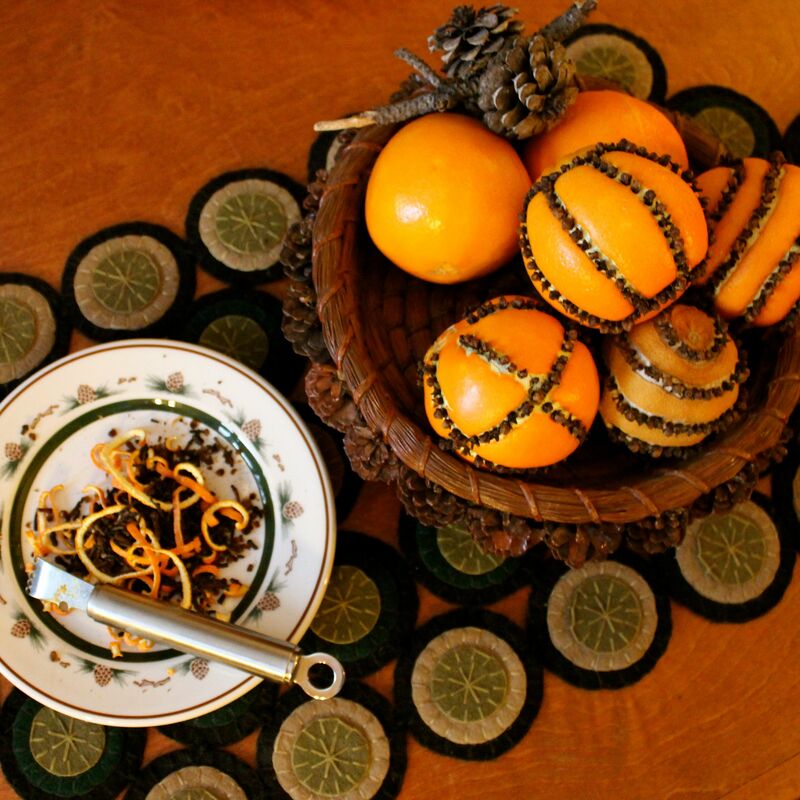 A good zester—you can make pomanders by sticking holes in the orange with a skewer and putting cloves in the holes. But my husband’s method is so quick and sensible that, if you’re serious about this, you should consider it. He uses a heavy-duty zester—the brand is Rosle. This zester sells for about $25, which, I admit, is a crazy price for such a tool but it makes this job so easy! And I’m sure you occasionally want zest for a cocktail or something, right? Or is that just me? 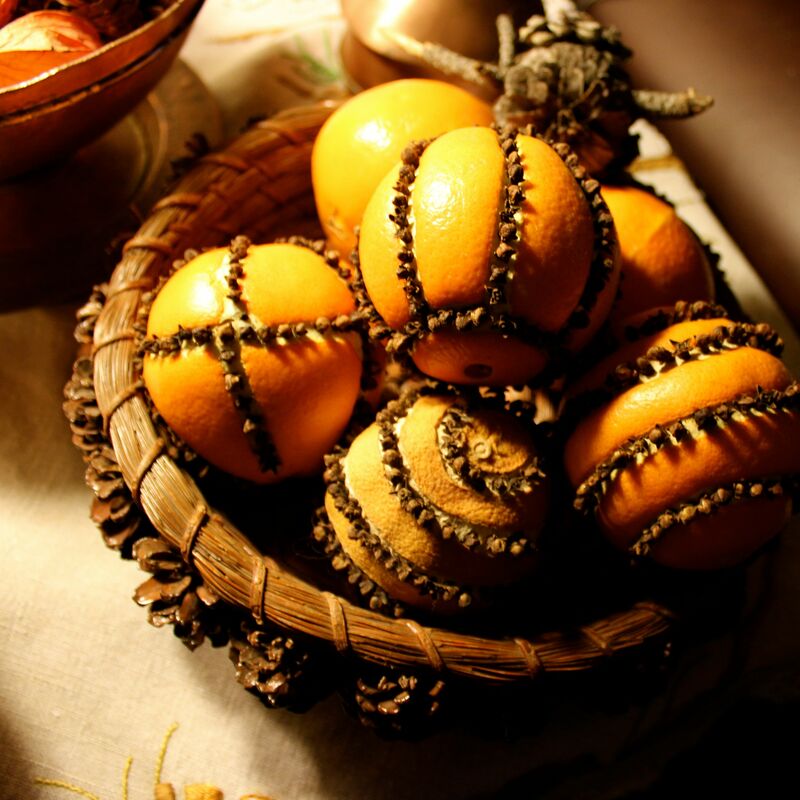 To make your pomanders, use the larger hole on the side of the zester, called a channel, to carve a design in the orange. It’s very sharp so you can easily do stripes or swirls or spirals or a happy face. You can probably do monograms if you choose! 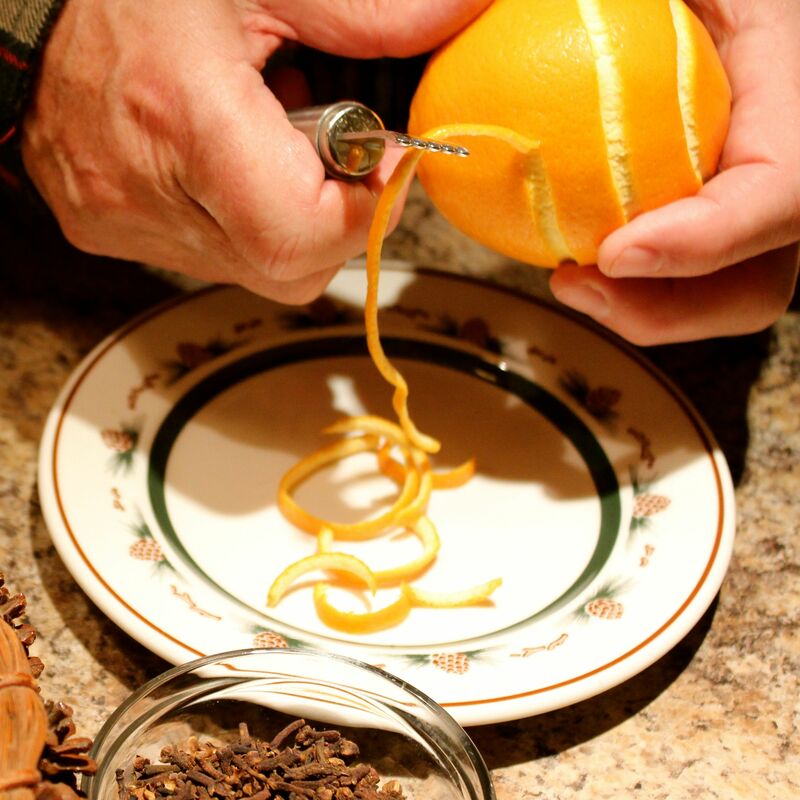 Be sure to carve enough lines for a lot of cloves—remember you’re trying to preserve the oranges. 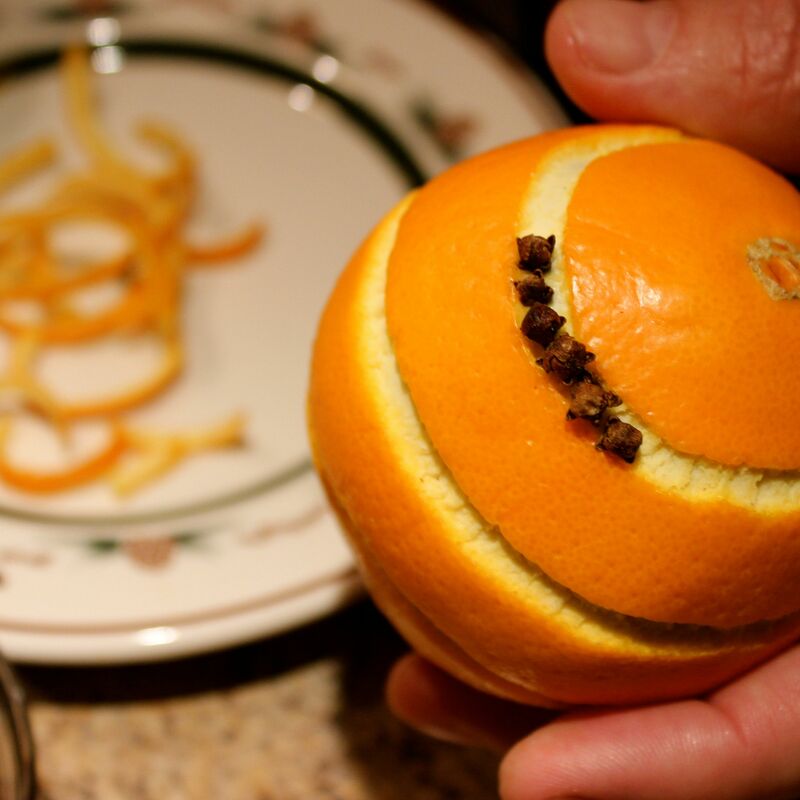 Once you have the design carved, stick the pointy ends of the cloves as far as they’ll go into the white pith of the orange. The cloves should go in close to each other, almost touching. Don’t be stingy—remember you’re trying to preserve the oranges! So easy that, while you’re doing all this, you’ll have plenty of time to breathe deeply. Smell that wonderful smell. 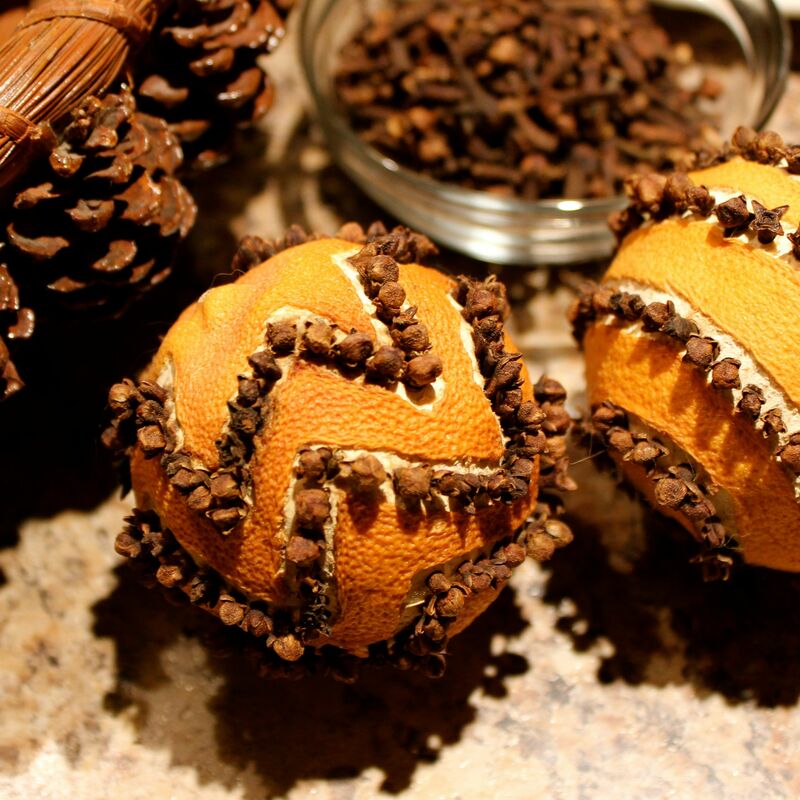 Finish one pomander and make another. And another. Tuck them into baskets and bowls and tie ribbons around them and hang them from a wreath or a tree. You may find it quite addicting! And next year, you’ll make new ones to nestle up against the ones from this year. The old ones will be dried out and a little pale and not as fragrant but, hey, that happens to all of us eventually! Pretty soon you’ll have generations of pomanders and a new family tradition. Start now! 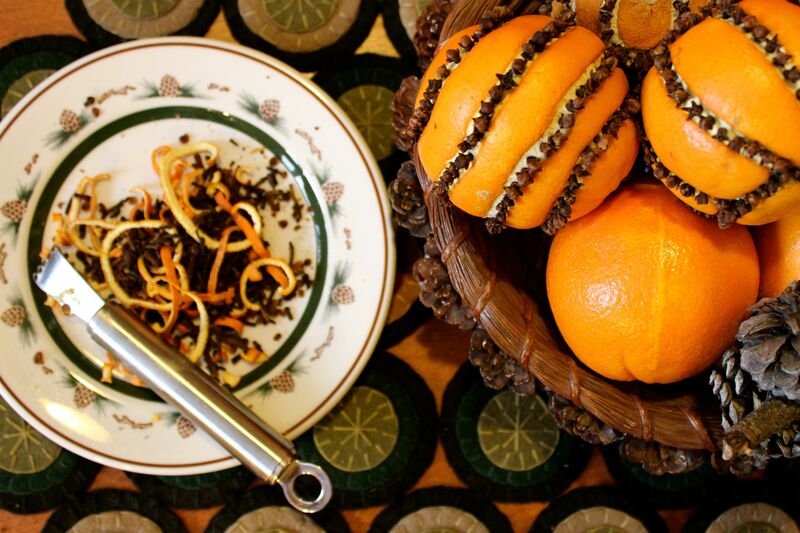 One more thing—don’t throw the little scraps of orange rind and broken cloves away! Put them in a sauce pan on your stove with some water and maybe a cinnamon stick and let it all simmer. Pay attention and add more water when needed and fill your home with the smell of Christmas! The Power of Positive Vibes . . . And a Great Sister! Thanks to the good vibes you directed my way and to my amazing sister, the holiday boutique I participated in was truly fun! It was a long day—we set up at 7:30 a.m., the doors opened at 10, and closed at 7:00 p.m.—but it went by pretty fast. Those of you who assured me that, of course, people would want to buy chocolate were right—we had lots of interest and lots of folks went away with chocolate for gifts, and for themselves. For the display table, I used some of my stash of vintage linens—I grabbed everything red and white—so it looked festive and different than the other displays. I polished up some Revere bowls and dragged out the vintage aluminum platters and was set to go. The most popular items didn’t come as a surprise to me—chocolate-covered caramels with fleur de sel have always been my best seller and peppermint bark just tastes like Christmas. I was so glad to have my sister’s help—most of the vendors were there by themselves and had no on else to rely on. Just having the friendly support of someone who totally understands me made a huge difference! My introverted tendencies didn’t get in the way. I’m not especially shy—I’m what a friend calls “an introvert with good social skills.” So the day went fine while I was there but I was glad to have a long-ish drive home the next day, alone, with no one who wanted me to talk to them! My people batteries are drained! So, thank you to all of you who were so supportive and made such kind comments beforehand and thanks, again, to the sister who is my biggest supporter and best marketer! I feel so lucky to have you all on my side! An Introvert Goes Public . . .
Later this week, I’ll do my first, ever, face-to-face selling of the candy I make. 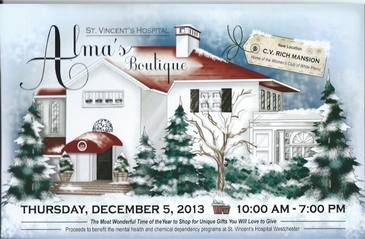 I’ll be at the St. Vincent’s Hospital’s Alma’s Boutique in White Plains, NY. Preparing for this event is part of what has been keeping me too busy to blog, or to do much else for that matter. Because I’ve never done a show like this before, I have no idea how much I’m likely to sell so I’ve made a LOT of candy. Preparing for an event like this has also reminded me what a perfect outlet Etsy is for introverts! I had a dream last night about being on a motorbike that I couldn’t control. I wonder where that came from . . . If you have any positive vibes to spare, send them my way! Winner of National Chocolate Day Giveaway! And, we have a winner! Thanks to all of you who entered the giveaway for a one-pound box of KerryCan chocolates! Readers had the nicest things to say about the candy photos, even those who were not able to enter the giveaway. I do feel bad about not being able to offer this to international readers and it was kind of many of you to let me know you understood! The winner of the candy is Kimmie, a fellow WordPress blogger from Making Mondays. She’ll be receiving a sampler of items from the shop but because she told me she loves chocolate turtles, I’ll be sure to include some candy that includes chocolate, caramel and pecans! Kimmie, please contact me at kerrycan2@gmail.com with your address. Happy National Chocolate Day . . . A Giveaway! National Chocolate Day?! Now that’s a holiday I can get on board with! In fact, I want to write a book because I have a title that I think will sell a million copies. I’m going to call it 50 Shades of Chocolate! To celebrate National Chocolate Day, I’m going to give one of my North American readers a one-pound sampler of the chocolates from KerryCan. It’s not that I don’t love my blog friends from around the world—I just don’t like to think of what international mail would do to a delicate box of candy. So, if you’re from the US or Canada and would like to enter the giveaway, all you need to do is leave a comment on this post. Tell me, in the comment, what your favorite chocolate candy is—do you like chocolate straight? 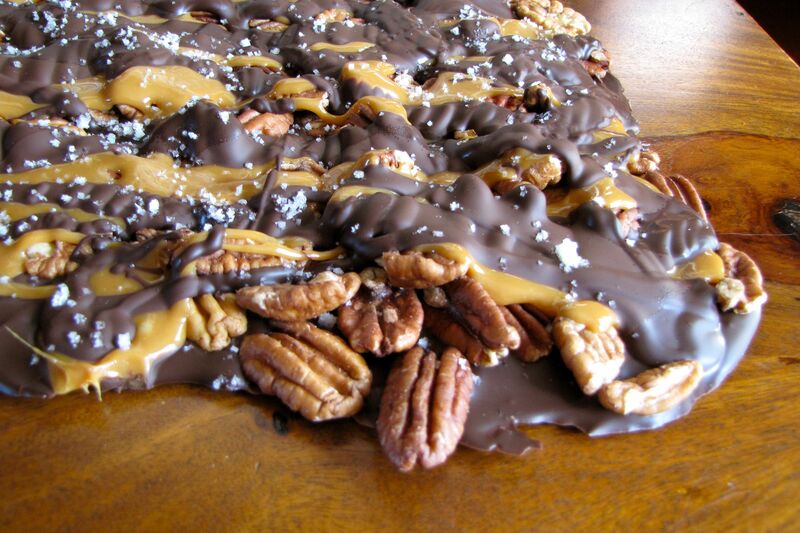 Or do you go for the chocolate-covered caramels? Or chocolate with peanut butter? Or mint? Or something else? Let me know and I’ll assign you a number, based on order of comments. Then I’ll use a random number generator to come up with the winner.